After yesterday’s century ride everyone seemed a little slower getting started this morning. Even so Alberta +1 was underway by 7:30. 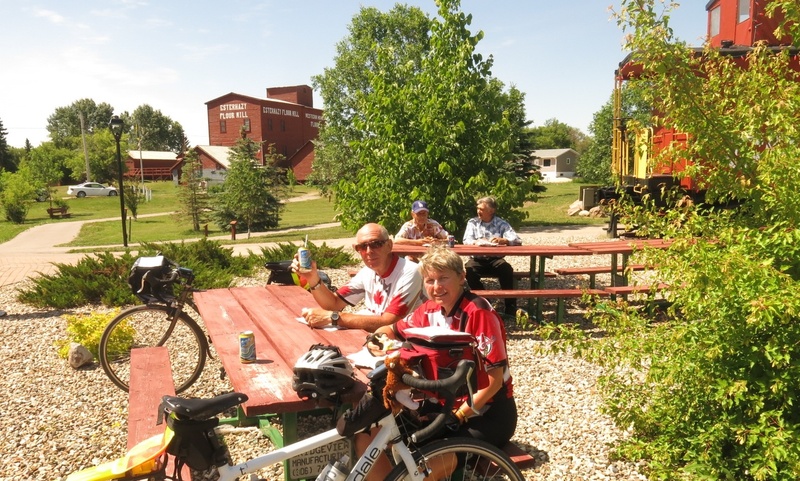 We continued to ride through the Qu’Appelle Valley for the first 35 k or so before turning to climb out of it. With a light tailwind the ride was quite pleasant although the climb was tough. Soon though we were back on the prairie. At the Stockholm Junction we stopped for coffee. Just before we left Rob and Mike arrived. 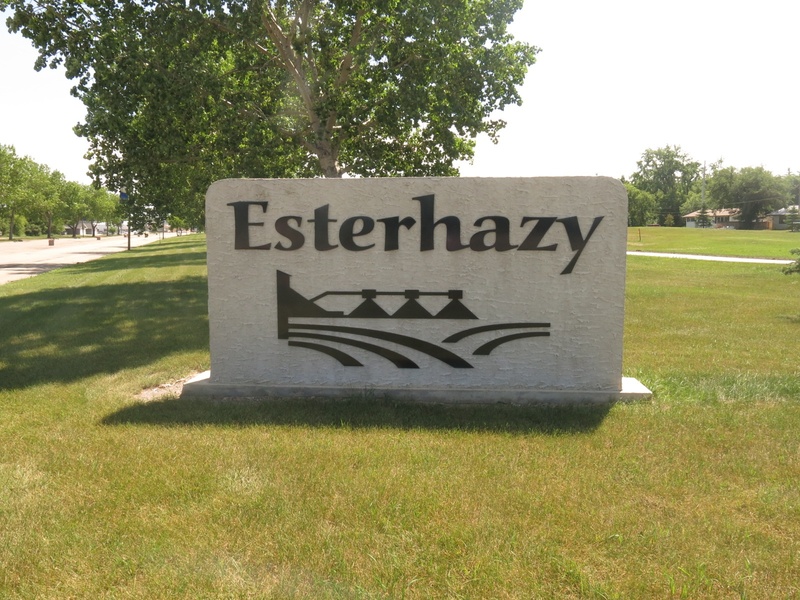 About 15 km further we came to Esterhazy, a town in heart of potash country. Stopping at the visitor Center we discovered a barbecue luncheon underway. 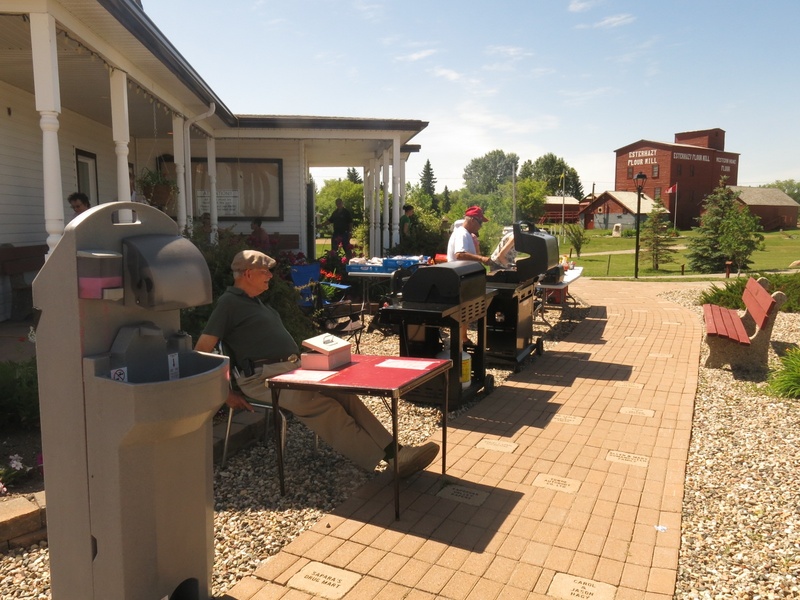 A group was cooking hamburgers and hot dogs as a fund raiser for the restoration of the local historic mill. A cheese burger and iced tea set me back $5.50 – a real bargain! 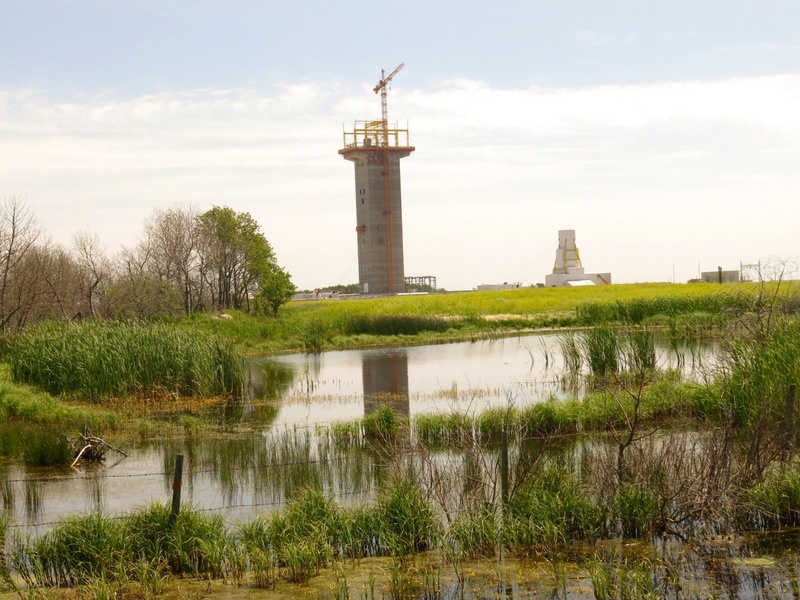 Just east of town we saw a new potash mine under construction. As we continued in an easterly direction there wasn’t much more until we got to the Manitoba border. The 15 km or so leading up to the border was quite rough. – bad pavement interspersed with gravel sections. Once in Manitoba the road seemed to get somewhat better. At the border we celebrated entering province #4. 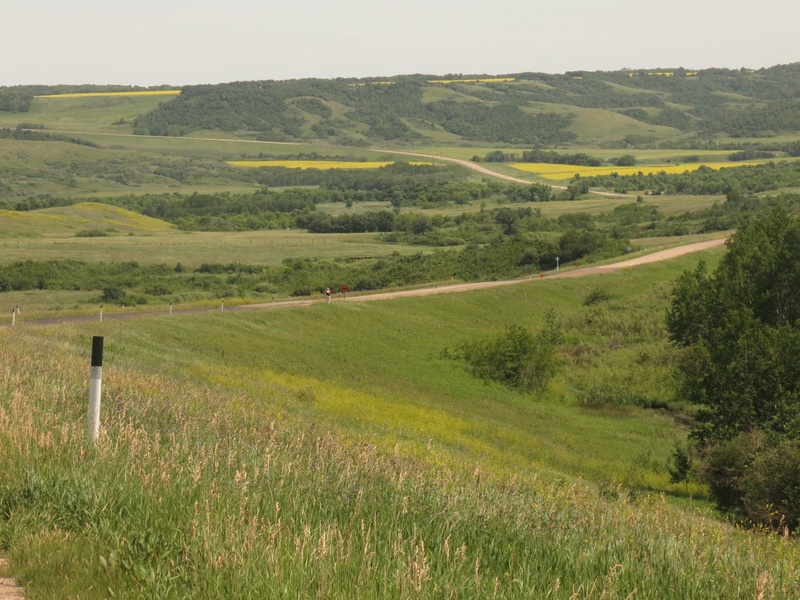 A few kilometers into Manitoba we descended into the Assiniboine River Valley. It was quite picturesque. The climb out of the valley was long and in the heat of the day (about 30 degrees) proved to be a real workout. Before long we arrived in Biscarth and our campground for the night. Total distance for the day was 128 km. We had time to pitch our tents and go for a quick swim in the pool before starting on supper. Our galley crew was cooking this evening with perogies on the menu. The campground has no cell service and while it does have Wifi, if you weren’t one of the lucky few who connected you couldn’t get online so my blog entries for the last few days will have to wait at least one more day.